Mother praises onboard baby whispering flight attendant. This flight attendant deserves a medal for the way she helped a mother and baby. Airlines in America have been attracting viral backlash after a series of incidents this month. Yesterday, United Airlines said it was “saddened” after a giant rabbit died in its care. It follows outrage at the airline after a doctor was filmed being dragged from an overbooked flight. Last week American Airlines publicly apologised after an incident between a passenger, a baby and flight attendant was filmed. 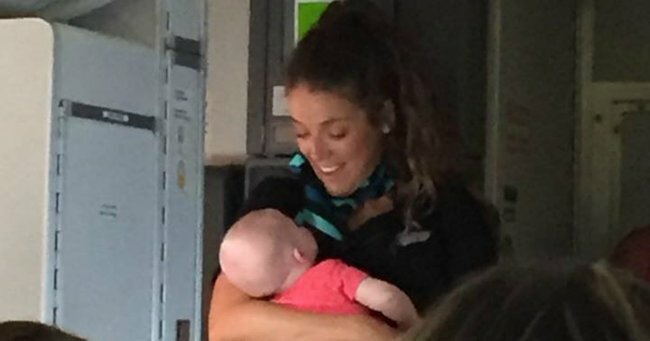 But one passenger travelling on Canadian airline, WestJet, has praised the efforts of an onboard “baby whispering” service. Whitney Poyntz was travelling with her four-month-old daughter, Kennedi, when “all hell broke loose”. “Our daughter was asleep when we boarded so we figured it would be an easy peasy flight, man were we wrong,” she said on Facebook. During the three-hour flight from Palm Springs to Calgary, the mother was struggling with an unhappy baby. “Eyes glaring, sweat dripping down our foreheads trying to get her back to sleep, in comes the hero of the day… a flight attendant named Ashley,” said Poyntz. The flight attendant offered to hold the baby and walk her up and down the aisle. “She did and got her calmed down. Now it may not seem like a lot but the experience was amazing,” she said. The mother’s grateful message has been shared over 8,000 times.